Global Economy Matters: Is Estonia Now Definitely Heading for a Hard Landing? 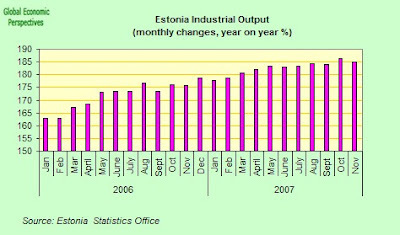 Is Estonia Now Definitely Heading for a Hard Landing? 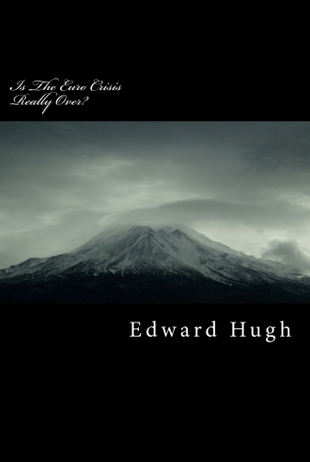 The only really big question about the EU10 economies as we enter 2008 is - among the more vulnerable ones (the Baltics, Bulgaria, Romania, and Hungary) - who will be the first to go. 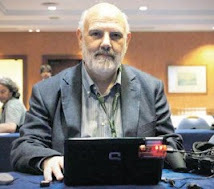 One obvious candidate is Estonia, although it is far from occupying poll position at this point, as Romania is teetering more and more by the day, and foreign investors look for the door in Hungary as the economy geers up to enter recession. But today we are focusing on Estonia, which Danske Bank A/S senior analyst Violeta Klyviene - echoing the words of ECB board members Jurgen Stark and Lorenzo Bini Smaghi - recently described as going from "boom to bust". Looking at some of the data I am presenting here, it seems hard to disagree. Basically we have two sets of curves to look at. One set go up, and they basically refer to prices. The other set go down, and they refer to levels of domestic economic activity and consumer and producer confidence. First inflation. Estonia's inflation rate rose in December to a nine-year high, led by food and housing costs, raising concern that price growth will destabilize the currency regime by making exports increasingly uncompetitive at the same time as domestic demand plummets. 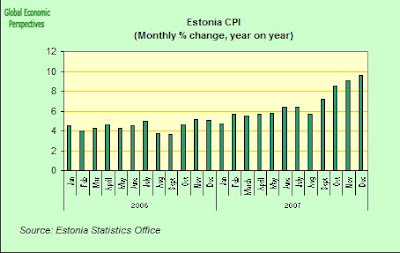 Estonia's inflation rate jumped to 9.6 percent, the highest since August 1998, from 9.1 percent in November, the statistics office said in Tallinn today. Prices rose a monthly 0.7 percent. And there is no sign of a slowdown in price increases in the near future. Finance Minister Ivari Padar recently forecast inflation in Estonia would be at least 10 percent in the first half of 2008 because of tax increases on alcohol, tobacco and fuel. 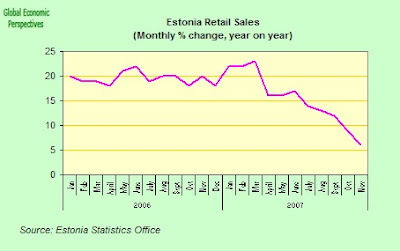 Estonian retail sales growth slowed in November to the lowest level in more than four years as consumer confidence weakened. Retail sales increased an annual 6 percent, compared with an unrevised 9 percent in October, according to data from the Tallinn-based statistics office last week. It was the lowest growth since September 2003, according to statistics office data. The statistics office describe the 5% month on month decline in sales as "characteristic of the period prior to Christmas marketing in December". This may well be, but the slope of the downward line in the above chart is remarkably constant. Still, we will soon know when we get the December data. 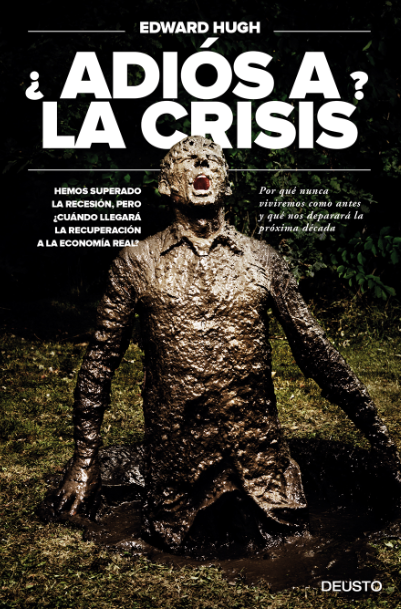 Banks such as Citigroup and Goldman Sachs have been increasingly saying the Baltic countries, and especially Latvia, face increased risk of a ``hard landing'' because of accelerating inflation and widening current-account deficits, and this has lead to increased speculation about a possible devaluation of the Latvian lats and the Estonian kroon. Finance Minister Ivari Padar forecast last month that inflation, which accelerated to the fastest pace in nine years last month, will be at least 10 percent in the first half of 2008 because of higher taxes on alcohol, tobacco and fuel. 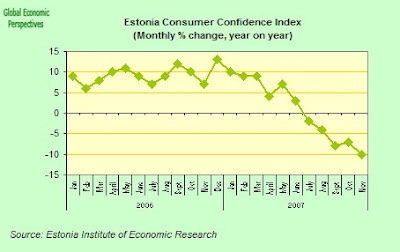 Consumer confidence fell in December to its lowest level in more than 2 1/2 years on worsening expectations for personal and state finances, according to the Estonian Economic Research Institute. The consumer confidence index fell to minus 10 this month from minus 7 in November, the Tallinn-based Institute of Economic Research said at the end of December. In December 2006, the index was at 7 points. Consumer spending has weakened in the past months due to rising interest rates and stricter lending terms set by banks, slowing the Baltic country's economic expansion in the third quarter to a four-year low of 6.4 percent. Rising inflation, at a nine-year high of 9.1 percent in November, has also worsened consumer's expectations. 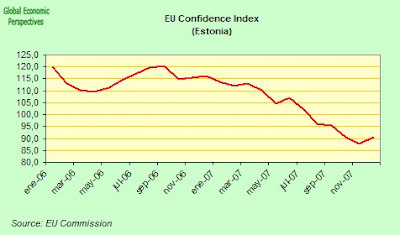 The latest release of the EU Commission Economic Sentiment Indicator for Estonia (published yesterday) gives us a very similar picture. Copmparing the three charts, and observing how they mark such a very similar line, I would say the position now is very clear indeed. 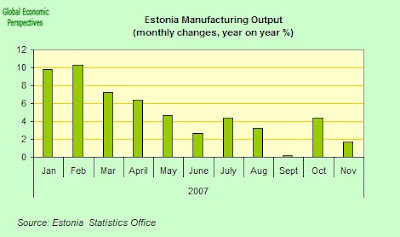 Estonia's annual rate of industrial production growth slowed significantly in November, with production falling in areas as diverse as dairy products and wood production fell. Output, adjusted for working days, rose an annual 4.4 percent, compared with a 5.9 percent rate in October. Production fell a monthly 0.7 percent on a seasonally adjusted basis, compared with a 1.3 percent increase in October. The economy is evidently slowing, although it would be hard to draw any definitive conclusion about how rapidly from this data. Industrial output growth was hampered by a slowdown in manufacturing as companies faced increasing labor shortages with unemployment at a 16-year low while domestic demand has evidently started to cool. 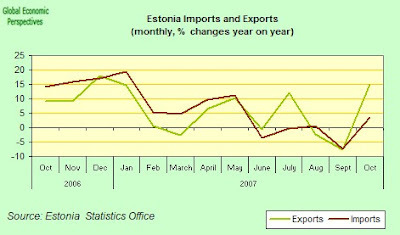 Estonia's trade deficit shrank to the lowest level in eight months in October as machinery imports fell from a year earlier. This is not a good sign, as it more than likely reflects a slowdown in investment. 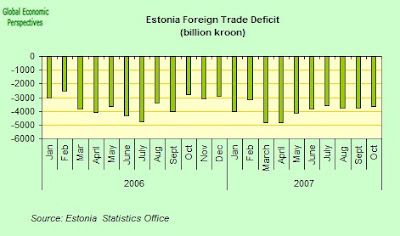 The October deficit fell to 3.6 billion krooni ($333 million) from a revised 4.6 billion krooni in October of last year and a revised 4.2 billion krooni in September, the Tallinn-based statistics agency said in an e-mail today. Basically the big picture is that import growth has stalled entering 2008 as Estonians spent less on cars, clothes and household goods due to rising interest costs and the weakening consumer sentiment. Export growth has also slowed as companies struggle with rising wage costs, which were up 20 percent in the third quarter. So what happens next? Well obviously all of this is completely unsustainable, especially as most of the EU10 and Eurozone countries (not to mention the UK) are all now themselves likely to slow significantly. So now, to answer my own question a hard, hard landing seem unavoidable. How will this manifest itself? well basically we should expect to see increasing pressure on the Kroon currency peg with the euro, a pressure which, in the short term at least, the Estonian authorities will try and resist. Basically, if we get the kind of very hard landing I am now anticipating, then we should expect to see inflation gradually ease, since there will be no demand pressure to push up prices. Possibly we will even see the reverse side of the coin, namely price deflation as we get into the second half of 2008, everything here depends on the pace of the "bust". The first indicator then should be a turnround in the upward movement in consumer prices, and the second should be an end to those famous labour shortages, as the long run trend in declining unemployment turns round, and unemployment starts to rise. We can already see that producer prices (lead by export producer prices which have been falling since the summer) have started to ease in October and November. This could be read as a firts indicator for what is to come. 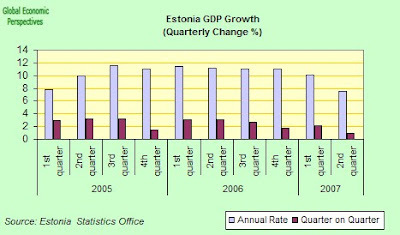 Estonian economic growth eased to 6.4 percent in the third quarter from 11.2 percent in 2006, and we should expact to see this rate of deceleration increase. And finally, and perhaps most importantly, unemployment. This has been trending steadily downwards, and should really expect the trend to reverse itself. 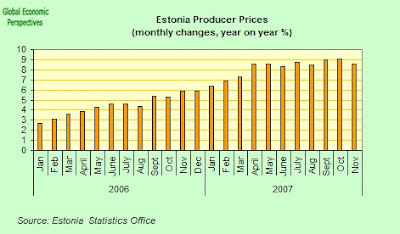 This will mean, basically, that the days when Estonia urgently needed to import migrant workers to try and avoid this huge spike in wages and prices is now largely passed. 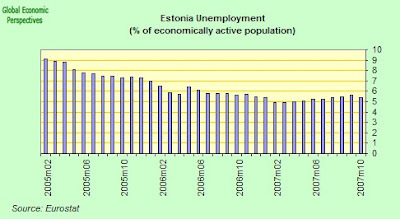 This does not mean that in terms of longer term stability Estonia does not need to focus on raising fertility and attracting new citizens from elsewhere to compensate for those who have simply not been born, but all of this will now take rather a back seat as the short term dynamics increasingly take over. One measure of the difficult situation Estonia will probably find itself in is that the policy priority will now need to switch from attracting migrants to retaining the young workers it already has and avoiding an uptick in out migration. It all depends on the level of distress which Estonia's citizen are faced with at the end of the day, and this depends on exactly how hard this hard landing turns out to be.